Our tour starts in the historic heart of Utrecht. We cycle along the Oude Gracht (Old Canal). The Oude Gracht connects the rivers Kromme Rijn (Crooked Rhine) in the south east and the Vecht in the north west of Utrecht. In Roman times the Rhine flowed through Utrecht. The location on the Rhine and later the canals are important reasons for the foundation, prosperity and growth of Utrecht. 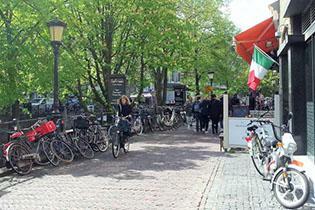 Along the "Oude gracht" there are many cafes and restaurants below street level. Until the end of the nineteenth century the quays and cellars were part of warehouses. The New Dutch Waterline (Dutch: Nieuwe Hollandse Waterlinie) was a defence line from the 19th century. 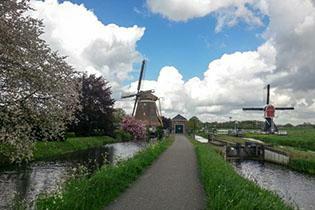 With a complex system of canals, locks and waterways large areas of land could be inundated. The waterworks and locks are very visible near two picturesque windmills (Westbroekse Molen and Buitenwegse Molen ) in Oud-Zuylen. Many areas around Utrecht are too far above sea-level to be innundated. So these areas were protected by forts and bunkers. Around Utrecht there are fourteen forts each with its own character. Our tour takes us to two of these forts. Fort aan de Klop (1821) is now home to a campsite and cafe. Fort Blauwkapel (1818-1821) almost at the end of our tour was built around the existing village Blauwkapel. We cycle over the cobbled streets through this fort and village. Due to its unique nature, the Dutch government nominated the whole New Dutch Waterline as a UNESCO World Heritage Site. 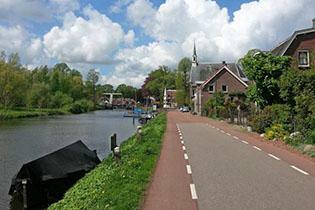 The tour follows the River Vecht which meanders through the landscape. Along the borders there are many country estates and castles. Most date from the Dutch Golden Age (the 17th century) and were used as summer residences for rich merchants from Amsterdam. Slot Zuylen (Zuylen Castle) dates from the early 16th century. The beautiful building and surrounding gardens are now a museum which is also used as an official wedding location. After passing windmill De Trouwe Waghter (The Faithful Guard), we enter a unique nature area. 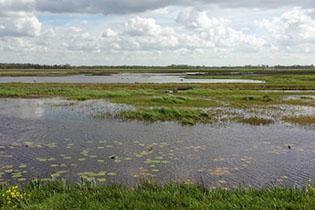 The Tienhovense Plassen (Tienhoven Lakes) consists of marshes, lakes, wetlands, and peat bogs. This area with its beautiful views is an important habitat for meadow, water and swamp birds. The little village Lage Vuursche is surrounded by the woodlands of the Utrecht Hill Ridge (Dutch: Utrechtse Heuvelrug). The Utrecht Hill Ridge is a 50 km long ridge of low sand hills that stretches from southeast to northwest over the Dutch province of Utrecht. It is the ideal place to have a traditional Dutch pancake for lunch. A visitor wandering among the 18th century houses feels as if time has stood still. The village has a royal status thanks to Princess Beatrix (the former queen) who lives in Drakenstein Castle. Boerderij Eyckenstein is a biological cattle farm (optional visit). Jersey bulls are small and slow growing. Usually, bull calves are killed and disposed of. At this farm the bulls are raised with their mothers. They can grow and graze in various nature areas in the Utrecht province. The cattle keep their horns, which is very rare in the Netherlands!